Rat Spinal Cord Neurons (RSpN) are derived from spinal cords of normal embryonic rat (gestation day 15) by standardized methods. When cultured under the recommended conditions, RSpN arborize and form complex neurite network in one week. RSpN Stain positive for β III-Tubulin. 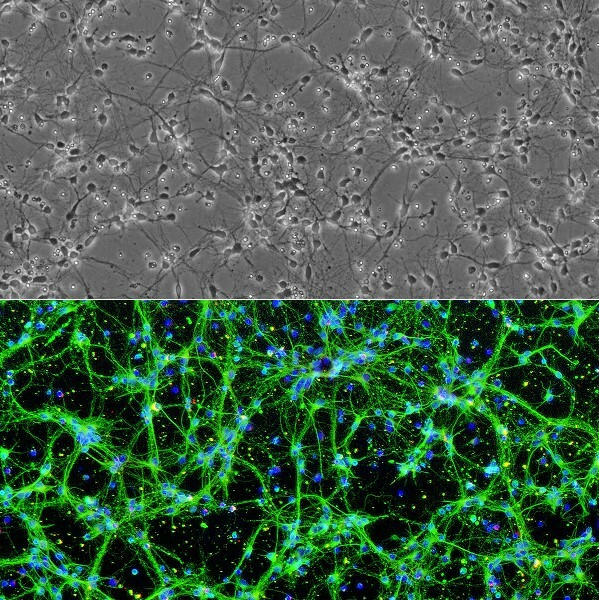 Neurons are available in multiple formats, including cryopreserved neurons, freshly isolated primary neurons in suspension, or pre-plated cultured neurons. The spinal cord is consisted of tubular bundles of nervous tissues and support cells. Extending from the medulla oblongata of the brainstem, the spinal cord transmits neural signals between the brain and the rest of the body, and plays a key role in somatosensory and motor functions. Spinal cord injuries, diseases and degeneration, such as Friedreich's ataxia, Amyotrophic lateral sclerosis, and spinal muscular atrophies, cause weakening or loss of sensory and motor functions. Studies using spinal cord neurons will allow a better understanding of the disease mechanisms, physiopathologies, and advancement in drug development and therapies. Cultures of spinal cord neurons can be applied for a variety of experiments including toxicity test, immunostaining, live cell imaging, co-culturing, electrophysiology, and more. (Click to Enlarge) Cryopreserved Rat Spinal Cord Neurons (RSpN) revived and cultured for 6 days (top), stained (bottom) on day 7 for β III-Tubulin (green), GFAP (red), and DAPI (blue).